Dead easy to use, and with quality sound, the iTrack Solo could be your ideal choice for recording electric guitar and bass, as well as acoustic guitar and vocals. iOS and computer connectivity. Halo level indicators. Software bundle included. Sound quality. Short iPad connector could compromise positioning (easily sorted with an extender cable). 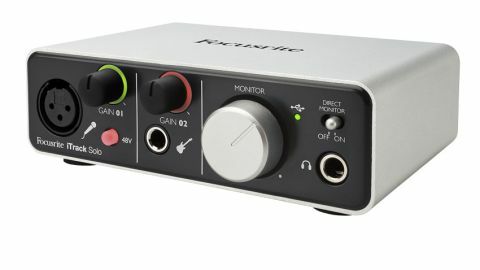 The new Focusrite iTrack Solo is a two-in/two-out audio interface for use with an iPad via the dock connector, but also fully compatible with a PC or Mac computer. "It features a guitar input, plus a phantom powered XLR mic input, each with its own input gain knobs"
Compact yet rugged, the iTrack Solo is powered via USB, so you'll need your Apple USB power supply (or a computer link) when using it with an iPad. It features a guitar input, plus a phantom powered XLR mic input, each with its own input gain knobs surrounded by an ingeniously useful 'Halo', which shows green when the signal is at a good level, and red if it's clipping. A monitoring knob controls the output from a standard jack headphone output plus L and R line RCA phono outputs, while a direct monitoring switch lets you hear the input audio latency-free. Focusrite has always been about sound quality, and the iTrack Solo doesn't disappoint. With quality 24-bit 96kHz A/D conversion and 105dB dynamic range, it captures all the nuances of your sound, and you can use both inputs at once and record them to separate tracks, if your software supports that. Be aware, though, because some iPad guitar apps such as AmpliTube take their signal from the left of a stereo input, and the iTrack Solo's guitar is on the right.